Decimal Lab : Text : Why Are Robotics Companies Dying? Rethink Robotics shuttered its doors and closed for good on October 4, 2018. 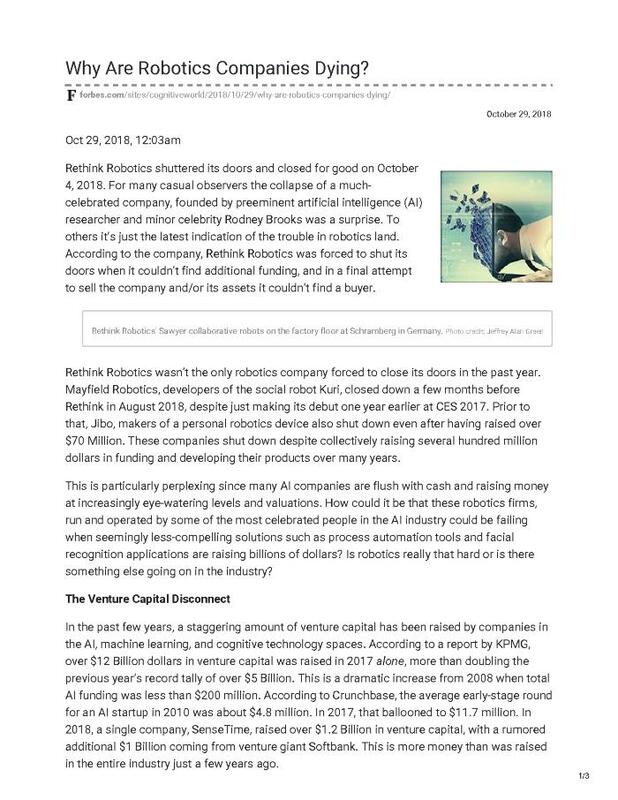 For many casual observers the collapse of a much-celebrated company, founded by preeminent artificial intelligence (AI) researcher and minor celebrity Rodney Brooks was a surprise. To others it’s just the latest indication of the trouble in robotics land. According to the company, Rethink Robotics was forced to shut its doors when it couldn’t find additional funding, and in a final attempt to sell the company and/or its assets it couldn’t find a buyer. Rethink Robotics wasn’t the only robotics company forced to close its doors in the past year. Mayfield Robotics, developers of the social robot Kuri, closed down a few months before Rethink in August 2018, despite just making its debut one year earlier at CES 2017. Prior to that, Jibo, makers of a personal robotics device also shut down even after having raised over $70 Million. These companies shut down despite collectively raising several hundred million dollars in funding and developing their products over many years.